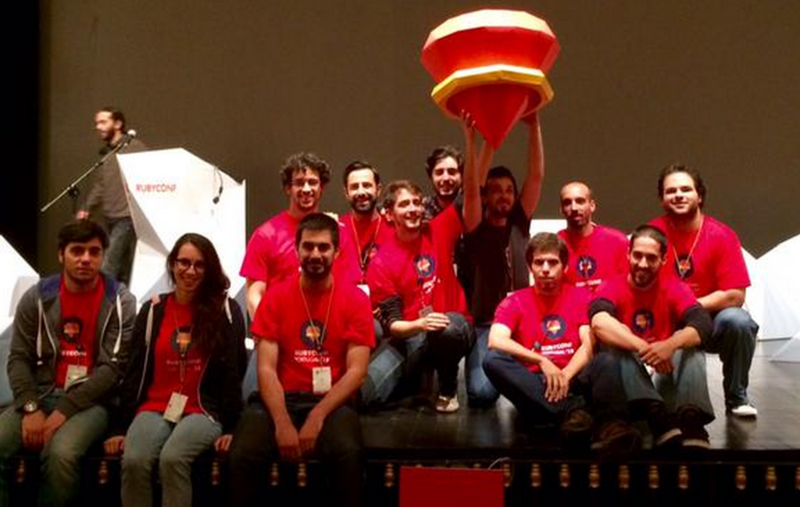 Last week, for the second year in a row, our team headed to the beautiful city of Braga for RubyConf Portugal. While we were greeted with grey skies, that did not lower our spirits – we were ready to enjoy the conference to the full! 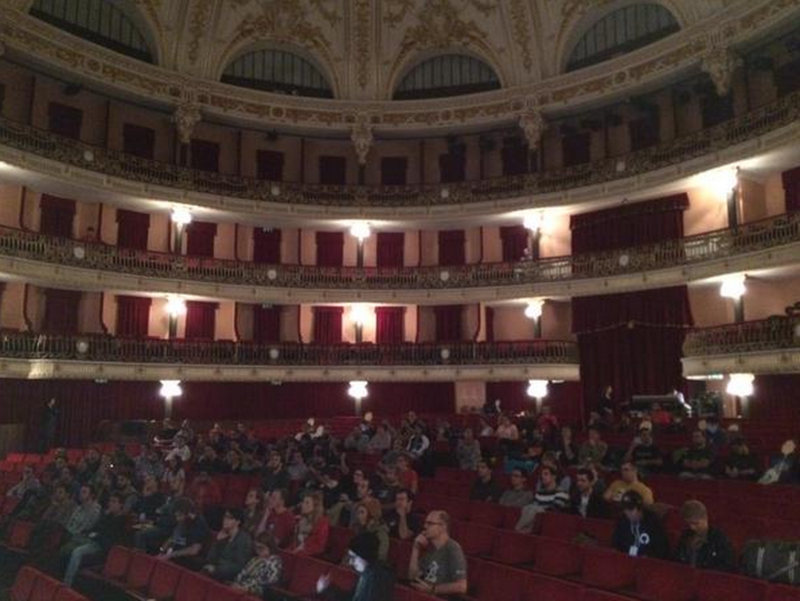 RubyConf Portugal is an intimate event of only 250 attendees, which allows attendees to meet and network with some of the most well known figures of the Ruby community. Besides great talks during the day, the organizers also managed to fill the evenings with fun events and, after just two days, we all felt like one big Ruby family! The conference’s “MC”, PJ Hagerty, did a fantastic job, as did the organizers. In fact, there were some particularly “magical” moments, such as when PJ opened the event dressed as Bilbo Baggins and gave a modified version of Bilbo’s birthday speech from Lord of the Rings. Watching this take place in the setting of Teatro Circo was surreal and absolutely mesmerizing! Evolution Of Keyword Parameters – Koichi Sasada offered us insight into Ruby MRI and the evolution of keyword parameters. Sasada is on Matz’s team at Heroku and a member of the core team that maintains the Ruby programming language, thus making him one of the most knowledgeable people in the Ruby world. The talk stressed the on-going effort of the core team to optimize Ruby by making it faster and easier to use. Ruby Smells – A great talk by Piotr Szotkowski about “code smells” (defined as a symptom in the source code of a program that potentially indicates a deeper problem), what it really means, and why it is often misunderstood. As a member of the reek core-team, Piotr provided us with an introduction to the tool and how to use it to identify and refactor found code smells. ‘Reek’ is a great code testing tool that identifies classic code smells, however it’s results are not yet 100% accurate. The conclusion offered by Piotr is that ‘Reek’ results do not mean that something is inherently wrong with the code, but that it exemplifies patterns which could be characteristic of code smells and, therefore, are to be taken with a grain of salt. Industrial Rails – An unusual talk by Christian Weyer which described how Ruby on Rails (RoR) is tackling challenges of mid- to large-size corporations. Weyer is a member of a small team of eight developers at Crispy Mountain, a software company which he founded with his childhood friends. Driven by the mission to create a more clickable world, the team pays special attention to various aspects of UI and UX, putting them in a position to compete – and often succeed – against industry giants such as Siemens and SAP. The agility of RoR offers makes them a top competitor in this highly dynamic environment; As Christian put it, “fail often and fast, and deploy daily”, as RoR allows for that. What Rust Can Teach Us About Ruby – An in-depth talk by Steve Klabnik on the similarities and differences shared by the Ruby and Rust programming languages in terms of bytecode and compilation. The main message of the program centered on Klabnik’s appreciation for different programming languages and the concepts, processes, perceptions that can be learned in a polyglot environment. His opinion was that you should never look down on a language, but rather join communities to improve the language and start contributing as soon as you can! He noted that the youngest Rust contributor is currently the 13 year old son of a Google employee. The Soul of Software – The conference closed with an enlightening talk by Avdi Grimm. It wasn’t particularly technical in nature, but rather an excellent and compelling discourse about the future of software and the responsibility that developers bear. The talk touched upon philosophy, human perception, ubiquitous computing and carried a great message directed towards the Ruby community on how the language and its developers can shape the world. What can we leave as a Ruby legacy for the community? If this is a question you’ve asked yourself, be sure to watch the video of Avdi’s presentation. You can also check out a great blog post that “MC” PJ Hagerty wrote about his experiences at the conference. We say goodbye to Braga and RubyConf for another year and hope that all of you have enjoyed the conference as much as we did! We hope to see you in Portugal again in 2016. Obrigada!